Fats. They are one of the main reasons many foods taste so good. And some fats taste better than others, making it even more difficult to say no to certain foods. Fast food french fries, for example, were often cooked in lard or beef tallow before the nineties, giving them a markedly richer taste compared to fries cooked in vegetable oil1. But all fats are not equal. And not all fats are good for us. Indeed, some of the tastiest fats may be some of the worst for our health. How do we know the difference? Dietary fats fall into three categories: saturated fats, unsaturated fats and trans fats. We will examine each of these in turn. Animals are the primary source of saturated fats. High levels are found in beef, pork, lamb and goat meat, and full-fat dairy products. 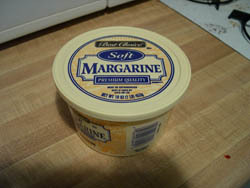 The saturated fat levels in beef fat is 50%2, lard 39%3, and butter 64%4. Poultry and eggs contain medium levels, with chicken fat consisting of 30% saturated5. Some vegetable oils, such as coconut oil and palm oil, are also very high in saturated fat, containing 82% and 49.3% respectively6. 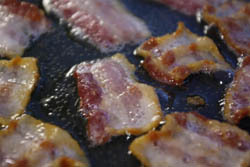 Saturated fats remain solid at room temperature. 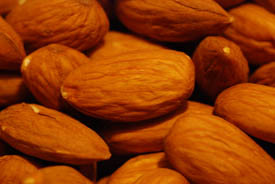 They should be eaten in small amounts, no more than 5 to 6 percent of your total calories. For someone eating 2000 calories a day, that equates to 11 to 13 grams of saturated fat7. Eating high levels of saturated fat increases LDL ('bad' cholesterol) and triglyceride levels (a type of fat converted from excess calories and stored in the fat cells), raises your blood pressure, and narrows your blood vessels8. All of these effects on your body increase your risk of cardiovascular disease. 6 United States Department of Agriculture, National Nutrient Database, "Oil, Coconut", and "Oil, Palm"